The Biotage Isolera One Flash Chromatography System brings you an advanced, fully automated compound purification in one compact package. This flash chromatograph features variable/two UV wavelength detectors with real time PDA scanning. The Isolera One has a flow rate of between 1 and 200 mL per minute, and a fraction capacity of up to 9.6 Liters. 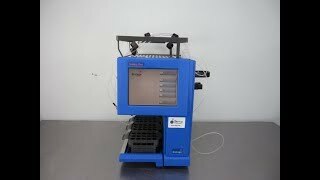 The Biotage Isolera One Flash Chromatography System is controlled through a windows based, user-friendly touch screen that’s fast and accurate in its response time. Users can select their protocols, including TLC to Step Gradient, as well as transfer methods to other Isolera systems. Using both wavelengths in this flash chromatograph ensures the collection of UV absorbing compounds to avoid wasting products and solvents filling tubes. These flash chromatography systems are also optimized for Biotage SNAP, SNAP Ultra, ZIP and ZIP Sphere cartridges from 5g up to 750g sizes. All of our Biotage Isolera systems come fully tested and validated by our service team. These Biotage Isolera One Flash Chromatograph have been thoroughly inspected and are performing to factory specifications. All of our lab equipment comes backed with our standard warranty. Should you have any questions, please don't hesitate to contact us.